Flat rate bee removal and control in Chandler, AZ. Guaranteed service for one flat fee. Honeycomb removal and repair service in Chandler, AZ. From start to finish we will take care of it all. 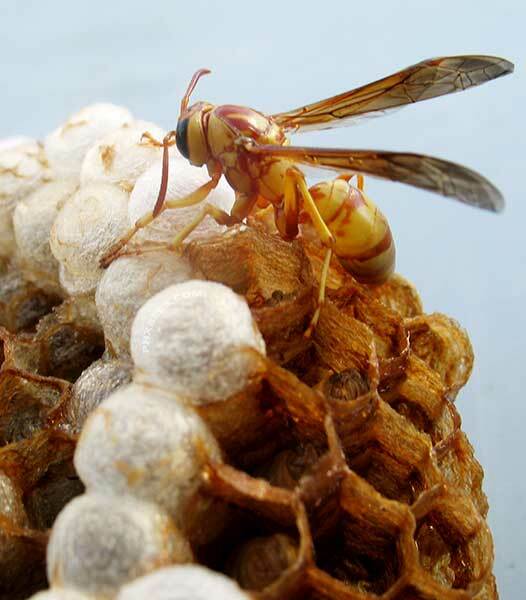 We offer extermination services for wasps, hornets, and other stinging insects in Chandler, AZ. 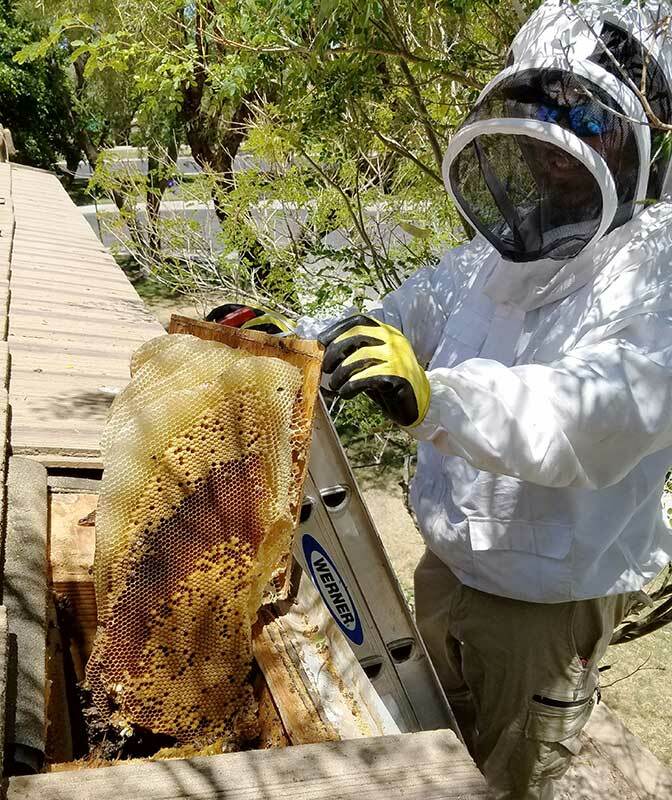 We provide hassle-free bee removal services as well as beehive and honeycomb removals and repair services for Chandler, AZ. We are well experienced and take pride in continuing to offer responsible, safe, and effective flat rate bee removal services all throughout Chandler and its neighboring cities. We are locally owned and owner operated that means no middle man and no inexperienced technicians creating a dangerous situation and possibly getting someone hurt. We handle everything from start to finish so you don't have to worry about any unexpected expenses or repairs. Having your bee problem handled by a professional is a very important step in keeping you and your neighbors safe from getting stung. 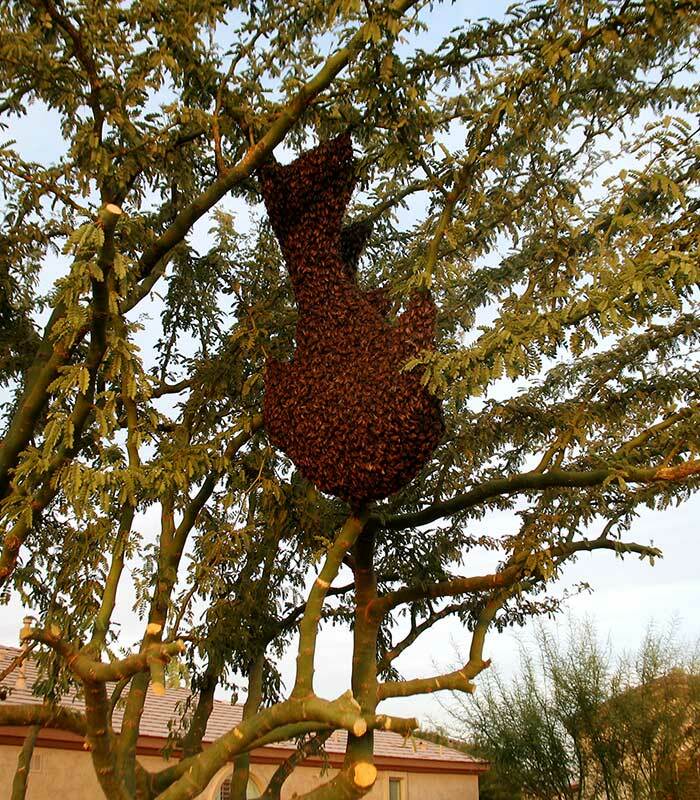 Chandler is home to a large amount of the valley's Africanized Bee population. 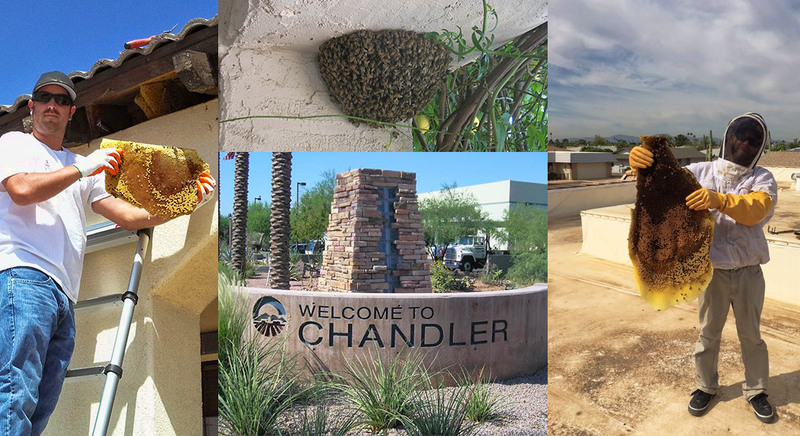 Our service calls have doubled over the past few years in Chandler and will continue to grow as more homes and shopping centers are built giving feral bees no choice but to move into populated areas. The more Chandler grows the more the chances for bee encounters increase and also bee attacks will become more prevalent. Phoenix Bee Removal LLC. is a bee removal service company providing bee removal services for Chandler and surrounding cities like Mesa, Gilbert, Tempe, San Tan Valley, and Queen Creek. We also offer honeycomb removal and repair services for one flat fee as well. Professional bee removal and control service for one flat rate. Servicing Chandler, Arizona for over a decade and counting. Our flat rate bee removal service is offered Monday thru Friday only during regular business hours. Weekends, Holidays, After-hours, and Emergency Service prices will vary. All of our services come with a service guarantee unless otherwise specified. We offer emergency bee removal service for Chandler 24/7. We will take care of any problem you have day or night if the situation arises. Keeping you and your family safe is of utmost importance and is always our top priority. 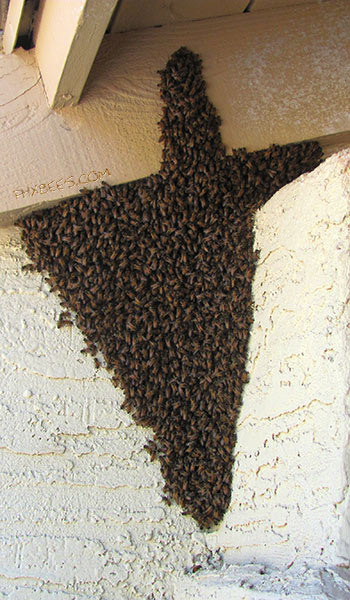 Bees can become very dangerous if the situation is not handled properly and in a timely manner. Africanized bees look exactly the same as the European honey bee. The only major difference being the aggression the bees have when defending their beehive. Africanized bees or "killer bees” as many like to call them are prevalent throughout Chandler AZ and the number of bee attacks is also rising due to people trying to treat bees without seeking professional help. Always call a licensed and insured bee removal company when dealing with honeybees. Using someone who is inexperienced can lead to unintentional injuries and even fatalities. We also provide guaranteed honeycomb removal and repair services for Chandler Arizona. Give us a call today and get a free quote for honeycomb removal from your home or business. Give us a call today to schedule an appointment or to get the information you need to keep you and your family safe. 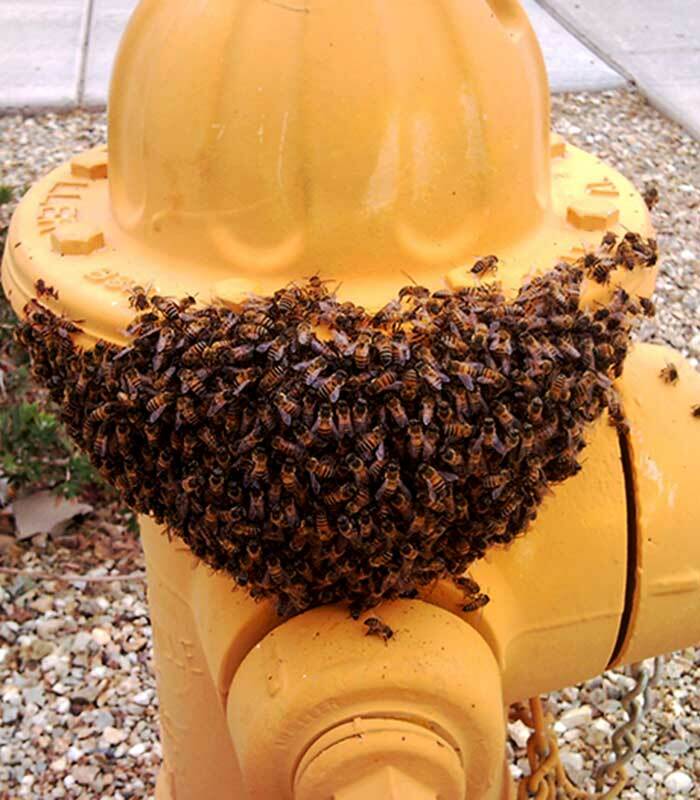 Bee Removal in the City of Chandler, Arizona. There is a lot of bee activity all over Chandler with the most being concentrated in 85225 and 85226. 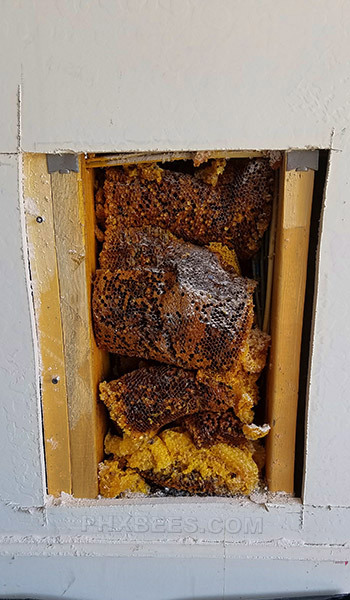 Bees have been a problem for Chandler homeowners for years and will be around for years more building honeycombs in the attics and under sheds. We have handled hundreds of bee removals in Chandler over the years. Some of the biggest honeycomb removals we have done were in Chandler back when there were a lot of foreclosed homes all over the valley. 100lbs. plus beehives were being removed regularly all over the valley.